Take a moment to picture, one of those days you learnt science. Raise your hand if you grew up learning science as a subject where you memorized terms, definitions and followed instructions and procedures straight out of the lab manuals…. It could be true for many. Many students think that science is all about memorization rather than active and live processes. More often, students have this misconception which have led to create a negative mental image about learning and exploring science rather than giving it a positive representation. In such an environment, “S & T 70” Educational Exhibition on Science and Technology would be a turning point for students to get a better understanding of what real science is. 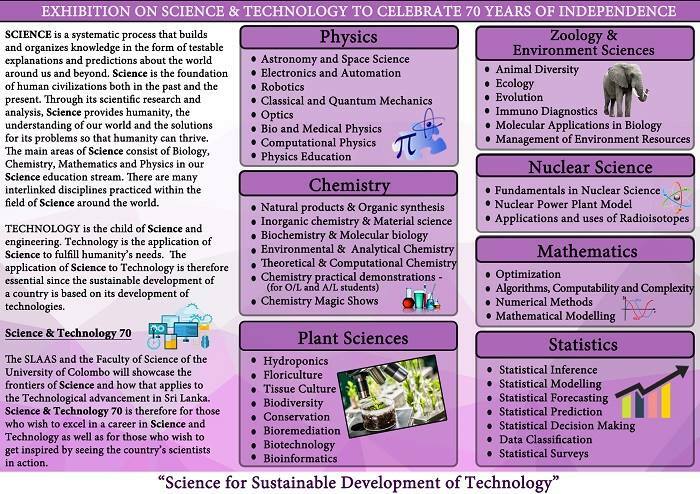 “S & T 70” Exhibition is organized by Sri Lanka Association for the Advancement of Science (SLAAS), the premier scientific body in the country, which is a keystone in fostering and assisting scientific endeavor and technological innovation for the benefit of the people in Sri Lanka. 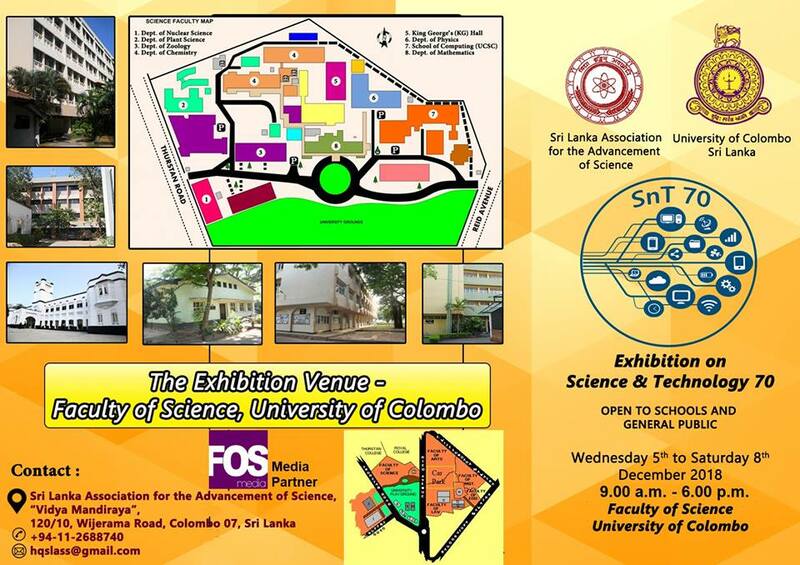 The exhibition will be held from 5th to 8th of December 2018 from 9.00 am to 6.00 pm at the Faculty of Science, University of Colombo and University of Colombo School of Computing (UCSC) premises. It is one of the most eagerly anticipated flagship events of this year’s SLAAS calendar. This massive expo is organized in line with its 74th Annual session to celebrate the Platinum Jubilee year of Sri Lanka gaining independence. SLAAS organizes this exhibition in collaboration with many state and private institutions including the Ministry of Science and Technology, National Science Foundation (NSF), National Engineering Research and Development Centre (NERD), Industrial Technology Institute (ITI), Arthur C. Clarke Institution for Modern Technologies (AACIMT), Sri Lanka Institute of Nanotechnology (SCLINTEC), Department of Meteorology, University of Colombo and University of Colombo School of Computing. The exhibition intends to cover many facets of basic science and its applications for technological needs. This would definitely aid students to develop a deeper understanding about science and create new explorative and creative opportunities by enhancing their natural curiosity. Also, this would surely ensure them to connect with science and thrive in the field of science, the many years beyond their scholarly career. Keep in touch with FOS Media to witness the most remarkable science expo of the year. We report best at first!